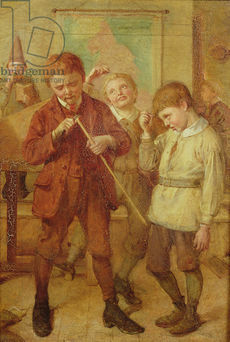 "In Trouble" by James Collinson (1825-1881). Note: This article should actually be named m/m. However, for technical reasons, articles in this wiki can't begin with a lower case letter. Therefore, the alternative lemma boy/boy was chosen. m/m is an abbreviation used in spanking art to signify an artwork or story that features a minor male spanker and a minor male spankee. In other words, a boy spanking another boy. It could be, for example, a boy spanking his playmate, another boy from his school, his brother, or his cousin. It could also be one putto spanking another. m/m is boy spanking art. A naked boy is birched by another boy, etching from a school book (1785). Two putti fighting, one with a rod. From The Adventures of Johnny Newcome in the Navy (1818). The Ironworker's Noontime, painting by Thomas Pollock Anschutz that has an m/m spanking in it, oil on canvas, 1880. This page was last edited on 11 March 2017, at 19:46.